4. The title should NOT be "Godzilla 2", but have the classic "Godzilla Vs....." title. 5. I prefer new monsters, but we'll most likely see classics like Mothra or Ghidorah. I prefer Ghidorah, Angilas or Rodan. 6. Incorporate the classic music somehow somewhere. At the end when Godzilla swam off, I was waiting for the classic theme but didn't get it So I hope we get for the sequel. 7. Next time when you have a cameo for an original actor, please keep him in the film next time rather than cutting him out. Would love to see Akira Takarada back for a small role. Maybe a fellow scientist to Ken Watanabe's character. Overall, loved the movie and anxiously waiting for the sequel! I'm actually crossing fingers for the title "King of the Monsters." Not Godzilla 2, just KOTM. The Great MM wrote: I'm actually crossing fingers for the title "King of the Monsters." Not Godzilla 2, just KOTM. Eh, I'm not really in favour of "Godzilla vs." titles this time around. I think they should feel a little freer to invent. The only way I'd be down with "vs." titles is if they use the titles of previously nonexistent movies that people claim to have seen anyway, like Godzilla vs. Rodan. A sort of de-mythologizing exercise. I think I am the only person that thinks you could remake Mothra 61 with a lot of the same plot points, save for tiny Shobijin and replace them with supernatural twin girls (that are not tiny) that are still exploited by the entertainment complex, have Mothra show up and rescue them (while causing destruction of course), and still have those showbiz guys come off as the villains despite Mothra's destruction. ‘Godzilla 2′: Which Classic Monsters Will Appear in the Upcoming Sequel? The subtext of the new Godzilla film isn’t exactly subtle: mankind has less control of nature than he thinks he does and any attempt to interfere with things beyond our comprehension will only result in our complete and utter defeat. So what happens when the disastrous work of man actually steps up to the challenge and creates a foe worthy of Godzilla’s attention? That’s basic idea behind Hedorah, an alien entity who devours Earth’s pollution and becomes a massive, unstoppable killing machine. It’s clunky social commentary, but he means business as a bad guy — he strips one of Godzilla’s hands down to the bone and tears out one of his eyes. Chance of a ‘Godzilla 2′ Appearance: Surprisingly high! We imagine that a modern Hedorah would be radically changed (he wouldn’t be an alien, that’s for sure), but the idea of Godzilla facing a foe that’s the direct result of mankind harming the planet would present our heroic kaiju with a truly unique and thematically resonant challenge. At this point, I just want to hear something from LP or WB on the sequel. Would love Hedorah to be the main villain in it... However, I really want another new creation. It keeps everything fresh. Well, we had something new already now it's time for something classic. Henry88 wrote: Well, we had something new already now it's time for something classic. I disagree. They need to keep it fresh. Mix new and old. perhaps a new one and a old one. Would love ATJ, Olsen and Watanabe to return. It'll make everything feel more connected. Maybe even get Cranston to narrate the trailers. I'm not sure a "vs" title makes sense...something like Godzilla 2 with an added subtitle is probably a better idea. As for Hedorah, I am sure he would work but have no desire to see him again. Hybrid Gojira wrote: As for Hedorah, I am sure he would work but have no desire to see him again. I hope we do see him again. I'd like Hedorah again, but I'd rather see Angilas, Rodan, Mothra, or Ghidorah before him. Godzilla 2: Mi-Mi-Minilla Poo Poo Poooooo! Seriously I want more of Monarch. The movie barely mentions it, but from the beginning credits and prequel comic they seem like a bigger part of this world than the movie let on. I want more of Ken and Monarch studying Godzilla and other kaiju. Also, I want more variation on the Godzilla roar. They liked to stick to the first part of the new roar but don't do enough with the second lower growlying moan. I'd like if they tried to emulate some of the other roars from the older series with the new vocals. - Dr. Serizawa's father in Hiroshima. It was brought up in the movie and based on Awakening the Hiroshima bombing is a major event in the movie's backstory, as well as Dr. Serizawa's backstory. I think it would be interesting if the sequel brought us back to that moment, depicted the attack, and then tied it in again with whatever is happening (sort of like how FCTW used Hiroshima). - Obviously, I'd love to see Serizawa, Graham, and Stenz return as recurring characters. - A female protagonist. I know that Edwards expressed interest in having a female lead character in this movie, even though they didn't go through with it. I think that would be a really great idea to work into G2, though. - Tokyo, or at the very least returning to Japan again. This could tie into my first point with returning to the Hiroshima bombing and having it relate, in some way, to whatever is happening in Part 2. - If they really do go ahead with the Monster Island idea, I think they should name it either Infant Island or Solgell Island. - Any title OTHER than "Godzilla 2" or "Godzilla II". I'm most fond of "Godzilla Returns" and "King of the Monsters". - Other than a few recurring characters, I do NOT want an ongoing story or plot. I think they should aim to mimic the Showa films or, even better, the James Bond franchise and how those movies are handled (no ongoing plots beyond a few references to past events, but a concrete set of recurring supporting cast). Hey, I like some of the ideas here. It would be interesting to further explore what factions of Monarch are out there or splintered off from the group. I do like the idea of the nuke off in SF Bay may have stirred something up. Personally I'd like to see Anguirus have a Southwestern origin. Maybe he has been known about by Monarch and has lived isolated in Nevada or New Mexico, or there were a few of them, but Monarch experimented on them, killing a female and a few babies in an experiment, but made the bull bigger, stronger, and most certainly angrier. A Monarch created Gigan. (with King Ghidorah as a second option) As for a title, Godzilla Returns sounds just fine. I want Godzilla to blow stuff up with his beam. Hedorah needs to go away. There are so many monsters I'd rather see...even if I think a new Hedorah could work quite well. I really want the opening scene to be Godzilla attacking a nuclear reactor. 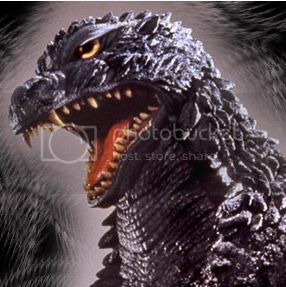 RapZiLLa54 wrote: I really want the opening scene to be Godzilla attacking a nuclear reactor. Especially because, even if he is a hero, he still has to feed. It's the perfect reason for the military to hunt and attack him as well. I don't know if I want that to be the opening (to be honest, I would really like the opening to be the Hiroshima scene I described earlier), but that would be an awesome scene to reintroduce Godzilla with! If it were up to me, that would be Scene #2. How long before the sequel actually goes into production, do you guys think? Obviously we're not getting a movie next year since this is Hollywood and they never move that fast and they haven't even started work on it beyond announcing it. Considering the timetable for this one and comparable Hollywood movies, maybe 2 to 4 years until release? The Transformer movies have usually taken only two years between films (T1 was 2007, T2 in 2009, T3 in 2011), although the first movie took 3 to 4 years. Godzilla took about four years from official announcement/script commission until release. King Kong (2005) took nearly three years (they approached Jackson in early 2003 and the film was released in Dec. 2005). Unless something horrifically unlucky happens, I'd say we could be looking at the sequel coming out in as early as May 2016 to as late as May 2018.